Preheat oven to 350 degrees. Remove leaves and stem from cauliflower. Cut cauliflower head into bite-sized pieces, keeping as much of the florets attached to the base as possible – avoid the crumbling of the florets. In a medium bowl whisk the eggs and cream, then add the salt, pepper, onion powder and garlic powder. Whisk in the seasoning. Add the cheese and stir in with the cream mixture. Arrange the cauliflower evenly in a 9″x13″ baking dish. Sprinkle some salt on cauliflower. 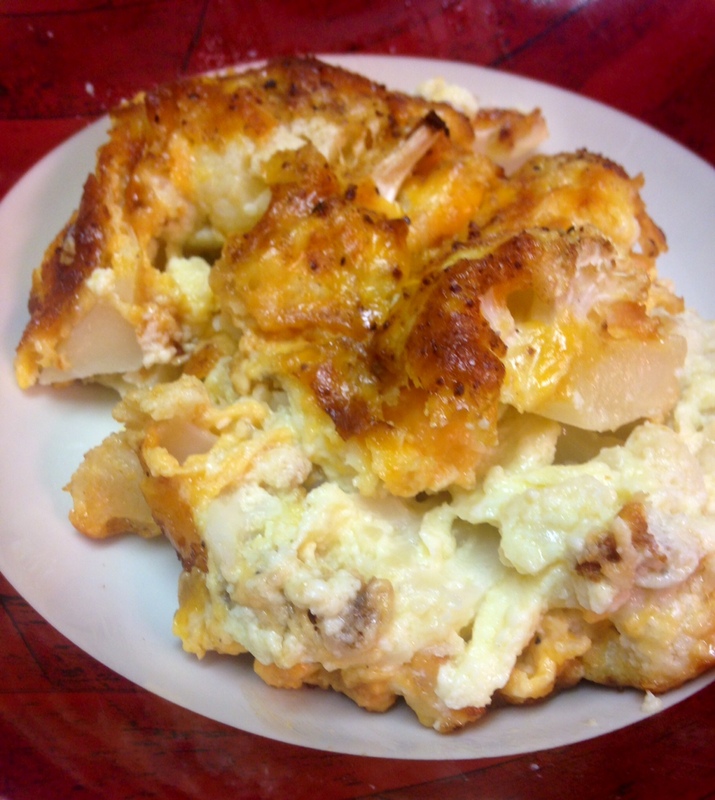 Pour creamy cheese mixture over cauliflower, spreading cheese to cover the top entirely. Sprinkle a bit more salt, pepper, onion powder and garlic powder on top. Place uncovered in preheated oven for 40-45 minutes, until top is browned and bubbly. Remove from oven and let sit for ten minutes before serving. Approximately what size are the heads of cauliflower that you use for this recipe? Sometimes I find heads of cauliflower that are 8″ or 9″ across, and other times they are half that size! This just looks and sounds devine!! I always seek out the 8-9″ larger ones. I have resorted to smaller ones, but would use 2 of them. Not idea, but I have also used frozen cauli, but it can risk making the final dish soggier. Of course, with this recipe, if you have less fresh cauliflower it won’t significantly impact the result – just makes it cheesier!